We have redesigned our Kpreps Kansas Game Day feature this week in order to provide you with a program for things to watch out for in Week 8 action. If you have suggestions for what you would like to see in future Game Day features, send us a message on Twitter or Facebook. For this week’s Game Day, we decided to check in on the league/conference races in each league at the 11-man, 8-Man, and 6-Man ranks. For a complete list of league standings, visit Kpreps.com/kansas/leagues or click on the Leagues below. Derby (4-0), Class 6A’s top-ranked team, can clinch the AVCTL-I title with a win against Haysville Campus (2-2). Hutchinson (3-1) hosts Maize (3-1) in a battle for second place. Goddard (4-0) travels to Newton (0-4) this week with a chance to claim the AVCTL-II title outright. Regardless of what happens this week, the Lions should be considered the dominant AVCTL-II league champs with an average margin of victory of more than 41 points per game. With one league game remaining, Buhler (5-0) is in the driver’s seat for an AVCTL-III title. The Crusaders have one league game remaining at Towanda-Circle (1-4) in Week 9. Maize South (4-1) is the only team within a game of the top spot, but the Mavericks lost to Buhler 21-14 back in Week 4. Andale (4-0) is in position for an outright league title if the Indians can beat El Dorado (1-3) in Week 9. The Indians hold the head-to-head tiebreaker over Mulvane (3-1) by virtue of a 61-52 win in Week 3. With two games remaining, Nemaha Central (6-0) holds a one-game lead over rival Sabetha (5-1) by virtue of last week’s 20-14 win by the Thunder over the Blue Jays. Both teams have league/district games remaining against Hiawatha (3-3) and Riverside (3-3). Manhattan (6-0) has clinched the Centennial League title thanks to wins over Junction City (4-1) and Topeka Seaman (4-1). The Blue Jays and Vikings will play in Topeka on Friday to decide second place in the league race. For Manhattan, the Indians clinch at least a share of the league title for the eighth time in the last nine years. Hoisington (4-0) remains unbeaten in CKL play ahead of Halstead (6-1) and Pratt (5-1). The Cardinals defeated Pratt 32-14, but do not have Halstead on their 2016 schedule. Pratt defeated Halstead 34-6 back in Week 6. Hoisington will be heavily favored in its last two district/league games against Larned (1-5) and Lyons (0-6). The top four teams in the CPL are all in the same Class 3A district. Chaparral (6-0) and Conway Springs (6-0) will meet Week 9, but the two have to first contend with Garden Plain (4-1) and Cheney (4-2) this week. The CNC title will be decided in Columbus on Friday night when the Titans (6-0) host Frontenac (5-0). The Raiders and Titans are ranked No. 2 and No. 3 respectively in Class 4A, Division II. Blue Valley (7-0) has clinched at least a share of the EKL title, but only Bishop Miege can tie the Tigers in the standings. Blue Valley defeated Miege, 35-28, back in the season opener. Blue Valley hosts St. Thomas Aquians (5-2) this week. Lyndon (6-0) holds a one-game lead on Council Grove (5-1) and Mission Valley (5-1). The Tigers have beaten both the Braves (26-8) and Vikings (41-32) this season. Council Grove hosts Mission Valley this week in a game that will likely double in deciding the District 4 runner-up. Lyndon can close out an unbeaten FHL title with a win over Chase County (3-2) this week. De Soto (4-1), Spring Hill (4-1), and Louisburg (3-1) are all in the mix for a Frontier League title. The De Soto Wildcats and Spring Hill Broncos each have one league game remaining against Eudora (1-3). Louisburg still has to deal with Ottawa (3-2) and rival Paola (2-3). Defending 4A-II champ Holcomb (4-0) can clinch an outright GWAC title with a win over Hugoton (2-2) in Week 9. The Longhorns currently hold a one-game lead over Scott City (3-1) who they defeated 32-13 back in Week 2. The Greater Wichita Athletic League, well known as the City League, is a four-team race with one week of regular season remaining. Wichita Heights (6-1), Bishop Carroll (5-2), Wichita Northwest (4-3), and Wichita South (4-3) are all 4-1 in league play. This week, Carroll plays rival Kapaun (2-5, 2-3) in the Holy War, a game the Golden Eagles have dominated in recent years. Meanwhile, Wichita Heights faces Wichita South, and Northwest travels to struggling Wichita Southeast. Heights lost 42-41 to Bishop Carroll last week, but the Falcons hold a 53-33 win over Northwest. Northwest defeated Carroll, 61-49 back in Week 1. Wichita South, with the unbalanced schedule, avoids Northwest on the schedule. The Titans did lose, 36-20, to Bishop Carroll in Week 7. Wichita Northwest is the defending City League champion, while Bishop Carroll has never finished outside of the top two spots in coach Alan Schuckman’s 22 years. Before last year, Wichita Northwest’s last two league crowns came in 2005 and 1994, according to GWAL archives. Wichita South has not captured a City League football title since 1991. Heights last won the crown in 2011 when the Falcons finished as 6A runner-up. Marion is the 2016 HOA League champion after posting a 6-0 record including wins over contenders Sedgwick (44-21) and Sterling (44-14). Cimarron (4-0) is in a great position to win the Hi-Plains League title. The Bluejays have remaining home games against Syracuse (2-3) and Southwestern Heights (2-3). Cimarron holds a one-game lead over Meade (4-1) as the Bluejays defeated the Buffaloes 20-14 back in Week 4. Atchison is the league champion after posting a 5-0 league mark. The Redmen are in a battle for a playoff spot in 4A-I, Distirct 1, however, after dropping their district opener to Tonganoxie, 22-16 in overtime. Basehor-Linwood is the league champion after a 5-0 mark has given the Bobcats a two-game lead in the league race. Basehor-Linwood has one remaining league game against Tonganoxie (3-2) in Week 9. Phillipsburg holds a one-game lead over Plainville including a head-to-head, 31-16 victory over the Cardinals in Week 3. The Panthers have a big league game at Norton (1-2) this week, while Plainville concludes MCL play at home against Ellis (1-2). Silver Lake is the MEL champ thanks to a 5-0 record and a 36-28 win over rival Rossville back in Week 5. Southeast of Saline (5-0) wrapped up the NCAA league title a couple of weeks ago with a 48-26 win over Beloit (4-1). Abilene (5-0) is the NCKL league champ by virtue of an unbeaten league mark including a 14-12 win over Marysville (4-1) back in Week 2. Jefferson County North and Jackson Heights may be on the way to sharing the NEKL title this season. The Chargers (5-0) and Cobras (4-0) each have one league game remaining, and are not scheduled meet each other this season. Jefferson Co. North hosts No. 1 Troy this week before closing league play at McLouth (3-2), while Jackson Heights travels to Horton (1-5) this week to finish league play. The Cobras began the season 4-0, but have lost three consecutive games and have been mathematically eliminated from playoff contention in their district. Santa Fe Trail (6-0) claims this season’s Pioneer League title by virtue of a late touchdown in bating Wellsville (5-1) 26-21 back in Week 5. The Chargers will now fight for their playoff lives after dropping their first district game 27-6 to Topeka Hayden. Santa Fe Trial travels to Jefferson West this week before hosting Holton in Week 9. There’s still plenty to be decided in the SEK League with two games remaining. Independence (3-0) sits atop the standings, but the Bulldogs still have to travel to rival Coffeyville (2-1) and host Chanute (1-2). Labette County (2-1) remains in the mix as well, although the Grizzlies fell 28-12 to Indy last week. Two key matchups on this week’s Sunflower League pit the top four teams against each other. 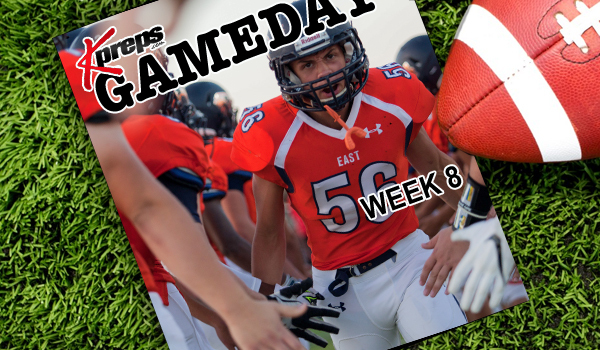 Shawnee Mission East (5-0) travels to Shawnee Mission West (4-1), while Lawrence Free State (5-0) hosts Lawrence (4-1). Depending on the outcomes of this week’s games, the Sunflower League could have one team win the league title or all four teams could share that honor. Among the head-to-head outcomes featuring these four teams; SM East defeated Lawrence 48-26 last week, while Shawnee Mission West topped Free State 41-40 in the season opener. Lawrence defeated SM West 49-19 back in Week 4. Shawnee Mission North (2-3) and all four Olathe schools (Olathe East, Olathe North, Olathe Northwest, Olathe South) are tied in the standings behind the top four teams. Jayhawk-Linn is the unbeaten TRL champions after the Jayhawks have posted an unbeaten 7-0 mark including 4-0 in league play. The Jayhawks have outscored their four league opponents 168-0 this season. You read that right, Jayhawk-Linn did not allow a single point in league play this season. The Tri-Valley League title appears that it will come down to a Week 9 battle between Fredonia (5-0) and Caney Valley (5-0). But first, Caney must win at Neodesha (3-2), and the Yellow Jackets of Fredonia must win at home against winless Eureka. Troy has clinched the TVL title by virtue of last week’s 20-6 win over Washington County, and a season-opening 58-27 victory over Valley Heights (1-1). The WAC title all comes down to Friday’s showdown between Garden City (7-0; 3-0) and Great Bend (7-0; 3-0). The Buffaloes are ranked fifth in Class 6A, while the Panthers are the top-ranked team in Class 5A. Read more about the Garden City versus Great Bend game in the preview of the Kpreps Fan’s Choice for Game of the Week. Fifth-ranked Central Plains (5-0) can wrap up the Central Prairie League title with a win against St. John (3-2) this week. Ness City (4-1) and Otis-Bison (3-1) each remain hopeful for a share of the title should the Oilers stumble; however, Central Plains defeated Ness City (54-8) and Otis-Bison (40-28) earlier this season. It looks like we will have a shared league title in the Heart of the Plains as Hutchinson Central Christian (5-0) and South Barber (5-0) do not meet during the regular season. Central Christian has one league game remaining against Burrton (0-5), while South Barber has completed its Heart of the Plains League schedule. Burlingame has finished unbeaten in the league at just 3-0, but the Bearcats have defeated the next closest league challengers in Hartford and Lebo. Burlingame won at Hartford 62-12 back in Week 2, and shut out Lebo 46-0 the following week. The massive 12-team Northern Plains League features unbeaten Osborne (4-0) at the top followed by Mankato-Rock Hills (5-1), Pike Valley (5-1), Beloit St. John’s-Tipton (4-1), and Wilson (4-1). Pike Valley travels to St. John’s-Tipton this week in a key NPL game and a key game in deciding the playoff qualifiers in District 4. St. Francis and Dighton remain unbeaten in NWKL play. The Indians (4-0) and Hornets (3-0) will not meet this season. Atwood-Rawlins County (4-1) remains in the hunt for a share of the title should Sainty or Dighton slip up. Another three-team league, the Santa Fe Trail League title will be decided in Week 9 when Moscow (1-0) travels to Rolla (1-0). Moscow has not won consecutive games this season, while the Rolla Pirates’ only two wins came in Week’s 5 and 6 on the road at Deerfield (54-0) and at Fowler (90-46). West Elk (5-0) and Caldwell (3-0) both remain unbeaten in SCBL play, although both teams are now fightin for their playoff lives after losing district contests. West Elk dropped a 66-42 decision to St. Paul, while Caldwell lost at Hartford, 56-42. Sedan (4-1) remains near the top, but the Blue Devils couldn’t slow down West Elk in last week’s 46-24 loss. Defending 8-Man, Division I Spearville (5-0) remain atop the SPIAA standings. The Royal Lancers host Leoti-Wichita County this week in district play. Ingalls (4-1), South Central (3-1), Satanta (3-1) and Hodgeman County (1-1) all remain near the top of the league standings with one loss. St. Paul will finish atop the Three Rivers League standings after posting wins over Pleasanton, Chetopa, and Marmaton Valley. Marmaton Valley (3-1), Colony-Crest (2-1), and Pleasanton (1-1) all have one loss and are vying for second place. Hanover (4-0) remains atop the 8-Man, Division II rankings and unbeaten in TVL play. Known for their prolific passing offense a season ago, Hanover has only given up 16 total points in six games this season. The Wildcats posted four consecutive shutouts to open the season. A third and final three-team race in the WKLL has already been completed. Logan-Palco rebounded from a 40- point loss to Osborne by blanking Lincoln 50-0. The Trojans travel to Solomon in a key game in 8M-I, District 4. Newcomer Herington has enjoyed the 8-Man ranks to the tun of a 6-1 overall record and 3-0 in league play. Close contenders include Wakefield (3-1), Solomon (3-1), and Rural Vista 2-1). Herington hosts struggling Marais des Cygnes Valley this week before closing out the regular season with No. 3 Burlingame. St. Mary’s Academy (4-0 has been the most consistent team in the KCAA standings this season. The Crusaders handled Wichita Homeschool 38-14 back in Week 2. Wichita Homeschool has gone on to post a 5-1 record against the league and 6-1 overall. Weskan won the inaugural 6-Man league regular season race by posting a 5-0 record. The Coyotes picked up a key league win on October 7th when they defeated Golden Plains (5-1), 72-45. Weskan quarterback Greg Kuykendall rushed for 222 yards, passed for 184 yards, and accounted for 11 touchdowns in the win. Weskan is on top of the bracket and will play the winner of tonight’s Cheylin (2-4) and Wheatland-Grinnell (1-6) game in the second round of the playoffs on October 28th. Dighton, ranked No. 3 in Eight-Man, Division II, is 7-0 and 3-0 in District 6. The Hornets, one of the state’s surprises this season, own wins the last two weeks at Sharon Springs-Wallace County and against Otis-Bison. Senior quarterback Tyler Lingg and senior wide receiver Dylan Foos have led the pass-heavy offense. Both players will finish as two of the best statistical players in eight-man history for their positions. This week, Dighton plays host to Hodgeman County (5-2, 2-1). Lingg, a four-year starter who helped Dighton win a playoff game as a freshman, has already set career bests for passing yards (1,251) and touchdowns (23). Overall, he has completed 294 of 486 passes for 4,269 yards with 58 scores against 16 interceptions. His 60.5 percent career rate is just off the state mark set by Kensington’s Kirby Rust of 60.7 percent from 1986-89. Rust later served as a longtime assistant at Thunder Ridge, including on the 2011 state title team. This season, Lingg’s 72.1 completion percentage is in reach of the state mark of 77.5 held by Osborne’s Jake Tiernan in 2013. Foos has 158 catches for 2,452 yards and 37 scores, including 14 reception touchdowns this year. He could threaten the career receptions mark of 210 held by Brewster’s Kyle O’Connor from 2002-05. South Central is 6-1, 3-0 in Eight-Man, Division I, District 6 with both playoff spots likely decided in Week 9 in a matchup with Argonia-Attica (6-1, 3-0). The T-Wolves are well known for senior quarterback Gerald Morehead and senior lineman Kody Huck. Both have been limited this year, but South Central is on course for its fourth straight playoff berth. Morehead has played in five games and accounted for 13 touchdowns. He hasn’t played since Sept. 30. Huck has appeared in just three contests and hasn’t played since Sept. 16. In their place, senior Charlie Barragan, sophomore Cody Lohrding and freshman Chayde Snyder have stepped in and performed admirably. Lohrding has completed 22 of 43 passes for 193 yards, while Snyder is 21 of 34 for 531 yards. Along with Morehead’s 236 passing yards, South Central has thrown for 1,008 yards with 54 percent completion rate. Snyder threw for 261 yards last week against Fairfield. Barragan has 22 catches for 465 yards and eight scores. Additionally, he has a team-high 146 defensive/special teams yards. Lohrding has five interceptions, while Barragan has two. He has a pick-six and a kickoff return for a touchdown.